There is a lot written about the supposed civil-war within the Democratic Party. Throughout the primary elections, every few weeks, a new take was written claiming that the political outsiders were in their ascendancy or that the establishment had successfully squashed another revolt. Here, we put this theory of a divided party to a test. I find that there are some important differences, but that these differences are not really about policy. Instead there exists a group of younger, very active Democrats that oppose the traditional leadership but hold much of the same preferences on issues (although maybe a little bit more liberal). First and foremost is trying to identify the divide. There is no clear indicator of who is the “establishment” and who is the “outsider” so instead I use a proxy: feeling towards the Democratic National Committee (the DNC) and the Democratic Socialists of America (DSA). I labeled those with a more favorable view of DSA than the DNC as Outsiders, those with a more favorable view of DNC than the DSA as Establishment and those that rated them the same as Fence-Sitters. The ratings used a thermometer question where survey participants are asked to rate a group or person on a scale of 0 to 100. I found that a bare majority of 52 percent were Establishment oriented, 40 percent were Outsiders and 8 percent were Fence-Sitters. Before going into the details of issues and activity it is useful to look at preferences towards candidates. This allows us to double check that we are capturing the right set of people. What I expect is that those with an Establishment orientation like Barack Obama, Hillary Clinton, and Joe Biden more than the Outsiders while the Outsiders like Bernie Sanders and Alexandria Ocasio-Cortez more than those with the Establishment orientation. This is exactly what we find. Using more thermometer measures we find that there are gaps in the average feeling towards each of those candidates in the directions we expect. The gap for Clinton and Alexandria Ocasio-Cortez as especially wide. Interestingly, several of the 2020 nominees (Kamala Harris, Kirsten Gillibrand and Cory Booker) have equal levels of support from both groups. Elizabeth Warren and Beto O’Rourke on the other hand have marginally more support from Outsiders. If outsiders play an important part in the 2020 Primary these gaps might end up being very consequential. The 2020 Primary brings us to one of the most important differences found between these two groups. Outsiders are substantially more active. Survey participants were asked if they had taken part in a variety of political activities over the last 6 months. There was either a substantially small difference or Outsiders were more active. Outsiders were 11 percentage points more likely to have contacted an elected official, 8 percentage points more likely to have urged a friend to contact an elected official, and 7 percentage points more likely to donate. They were also, perhaps unsurprisingly, more likely to participate in protests and to have invited a friend to a protest as well. The energy within the Democratic Party then seems to be centered on those with a more positive feeling of the DSA than the formal Democratic organization, the DNC. This is important not just now, but also gives credence to the idea that these Outsiders will play an important role in the 2020 primary. How do these two groups differ in their priorities? In all honesty, they do not differ a lot. Survey participants were asked to award 100 points over a range of priorities for the Federal and State government. In the next two graphs I show the median points given for each option along with the 33 percent and 66 percent quantiles. The largest difference at the federal level is that outsiders are generally more focused on Medicare For All. Perhaps surprising, the focus on impeaching Trump is low for all groups and if there is any difference it is the Establishment oriented Democrats that want to put more energy into this. The preferences at the state level are even more similar across the groups. Looking at policy positions, there is a little difference between Outsiders and Establishment Democrats. To keep things short we will only look at preferences towards abolishing ICE and court packing. For abolishing ICE, Outsiders are more likely to strongly support this than Establishment Democrats. In contrast, court packing does not show any difference across the two groups. There is a clear preference towards packing the courts from both groups. Finally we can examine who is in these different orientations. To do this I went back to the original data and instead of creating groups I calculated the difference between the thermometer scores, with more positive meaning a large preference for DSA over DNC. I then estimated a simple regression model using age, race, education and gender. What I find is that age is very important, and that these interact with race and gender. The next few plots show the expected orientation across age and different races or genders. Negative numbers indicate a stronger orientation towards Establishment and it can theoretically range from -1 to 1. In general we see that older individuals are more oriented towards the establishment but the extent of change varies. 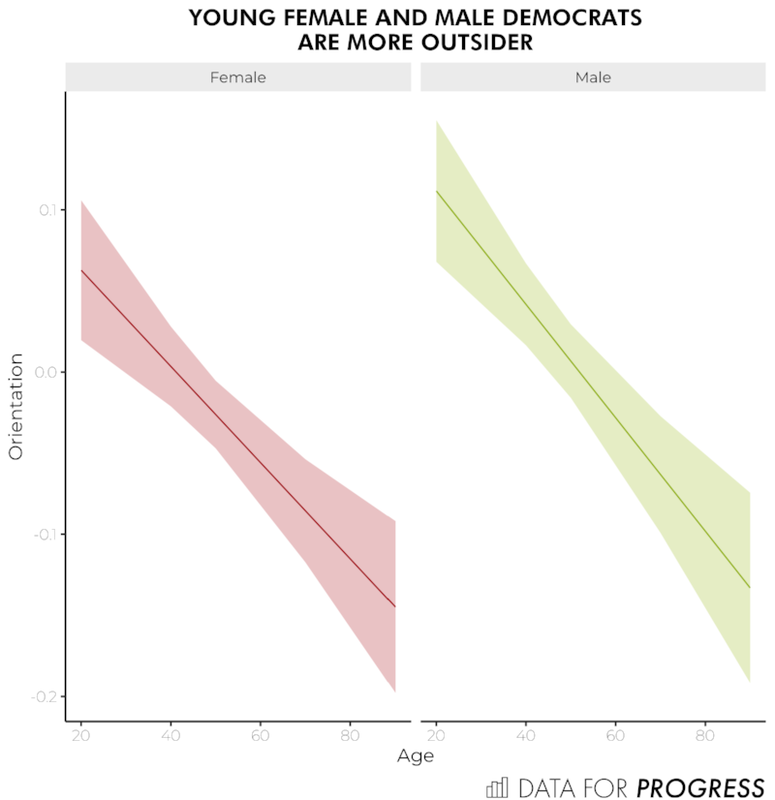 In general white voters hit both extremes with younger white voters being much more likely to be Outsiders and older white voters being much more likely to be Establishment Democrats. Black voters show a similar but less extreme pattern. A similar pattern is apparent for gender. Older men and women both tend to be much more Establishment while younger men and women are much more Outsider. There are differences within the Democratic Party, but these differences are not about policy preferences. The differences more likely how people approach politics. Younger voters make up a very active group of voters. They aren’t necessarily more liberal but they do have a different view of leadership. As this population ages they will likely play an even more important role in Democratic politics.